A top new album of kids and family songs by St Paul's Hammersmith's Nick and Becky Drake, tested and proven in their children's work. Produced by Matt and Dan Weeks, this is a quality kids album, with top musicianship and strong Scriptural themes. Album also includes printable PDF song scores. Big Family Of God by Nick & Becky Drake (ELE) is published by Essential Christian and is our 6785th best seller. 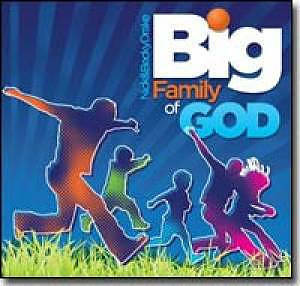 The ISBN for Big Family Of God is 5021776117032. This the sort of resource every church which runs all-age worship should have. The songs are brilliant for the children but have the Scriptural weight and depth to really engage with the adults, too. I look forward to more songs from Becky and Nick Drake! Got a question? No problem! Just click here to ask us about Big Family Of God. Now Playing: Creator God Your browser does not support the audio element.